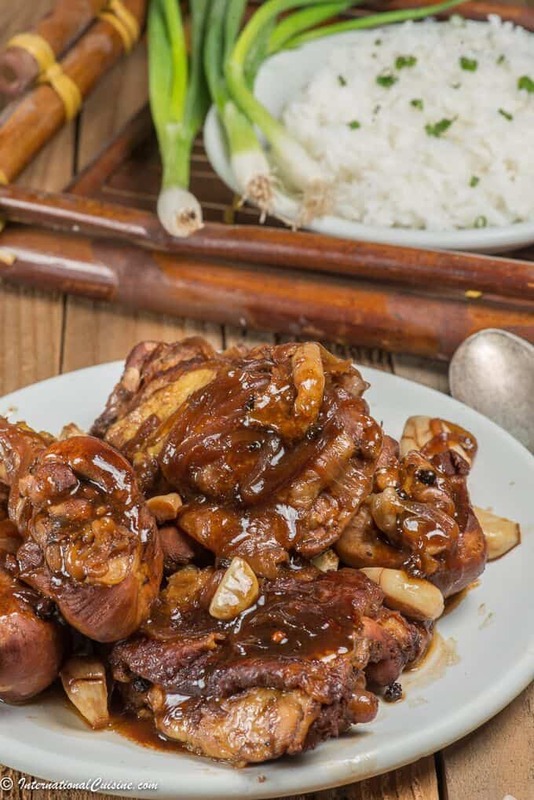 Chicken adobo is a Filipino treasure and considered to be the national dish. It was first noted by the Spanish back in 1613 as a method or preparation of cooking and preservation by the Filipinos. Adobo means marinade and comes from the Spanish word Adobar. Adobo, is often prepared with chicken but can also be made with pork, seafood or even vegetables. Any of these ingredients are marinated in what is called adobo sauce: a mixture of vinegar, soy sauce, garlic and peppercorns, before being browned in oil, and simmered in the marinade. This recipe was made with chicken . The result is a tender, falling off the bone, finger-licking delicious piece of chicken. Honestly, this chicken adobo might just be the best chicken I have ever tasted. It is traditionally served with white rice. 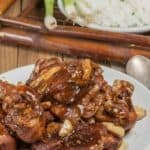 Adobo can come in many forms, this one is known as a black adobo because of the use of soy sauce. There are other adobo’s which are regional that are white or blond using salt instead of soy sauce, and even one flavored with turmeric that is yellow. Some are made with coconut milk and others with spicy chilies. This one however is the one I think is most famous and loved all over the world. In the Philippines, the dish was traditionally cooked in small clay pots called palayok or kulon. Today, woks called (kawali) are used instead and is what I used to make this recipe. The most important ingredient of Filipino adobo is vinegar and what I believe what makes the chicken so incredibly tender. Coconut vinegar, rice vinegar, or cane vinegar would all be considered traditional, although white or cider vinegar are now often used. I made it using white vinegar. Did you know that in the Philippines a popular mode of transportation is called jeepney’s. These are converted jeeps that the Americans left on the islands that have been extended and made into mini buses. If you would like to learn more about the Philippines be sure to check out “Our Journey to the Philippines”. There you can also get more authentic Filipino recipes. This truly may be the best chicken you have ever tasted. It is easy and it will make your taste buds sing! In a bowl, combine chicken, soy sauce, vinegar, sugar, garlic, onion, peppercorns, and bay leaves. Cover and marinate for at least 30 minutes in the refrigerator. Drain chicken and set marinade aside. Heat oil In a large skillet over medium heat. Add chicken and cook on all sides for 8 to 10 minutes, until chicken is lightly browned. Add the reserved marinade and water. Stir and bring to boil. Cook on high heat for 5 minutes, then lower heat, cover, and simmer for about 25 minutes, or until chicken is cooked through.